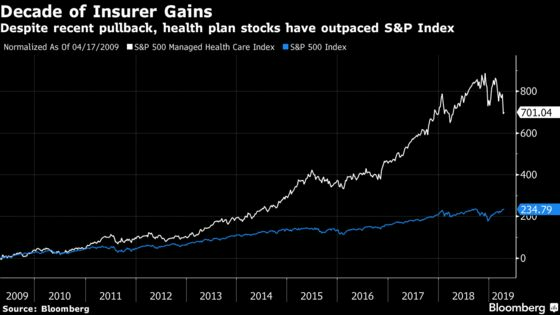 (Bloomberg) -- The U.S.’s biggest health insurer sharply criticized the “Medicare for All” proposals being debated by Democrats, wading into a heated Washington political debate that’s likely to dominate the 2020 presidential race and the conversation about the future of private health plans in America. As a source of coverage, UnitedHealth is almost as large as Medicare itself. It provides health-insurance services to 49.7 million people, and last year recorded revenue of $226.2 billion. Along with insurance, it operates physician practices, sells consulting and data services, and administers drug benefits. It also covers millions of people in the private-sector versions of Medicare and Medicaid. Despite its immense size, the company has kept a relatively low profile with the wider public. Its quarterly earnings are typically buttoned-up events, treated as a financial indicator for other insurers who report later in the earnings season. Engaging in a political fight could turn it into a political target as Democrats look for winning issues. On Tuesday, UnitedHealth shares reversed their gains in pre-market trading after the company reported positive earnings. The shares were down 4.2 percent to $220.56 at 11:30 a.m. in New York after the earnings call concluded. Read more: What is “Medicare for All?"